Typically, a regional brewery introducing a new limited run DIPA available for a few months wouldn’t exactly be significant beer industry news. But when that brewery is Firestone Walker, and that beer is more or less the philosophical stand-in for the dearly departed Double Jack IPA, that’s a very different story. That’s what we have here today in the form of FW’s new unfiltered DIPA “Fortem,” the first in its new Leo v. Ursus chronology. 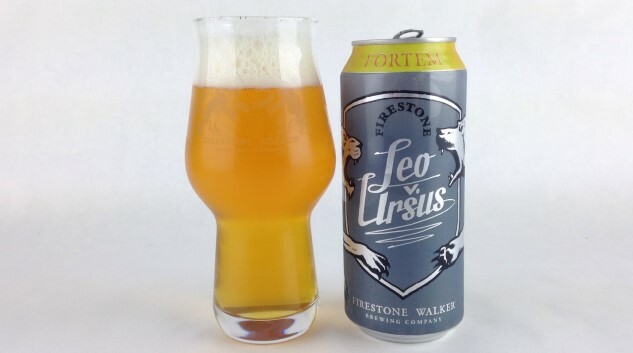 This is a beer that will have a very sturdy critical eye directed at it, as it will be taken to represent Firestone Walker’s opinion on the current beer market, consumer taste and where the industry is going from here. It feels like a bit of a watershed moment, at least for this one brewery that has a reputation for doing hoppy beer well. The reason for that perception, of course, is how beloved Double Jack was to Firestone Walker fans. It was truly shocking when the brewery announced it was being retired (along with Wookey Jack black IPA and the Opal saison), because rarely do you ever see a regional brewery retire a very well-liked, highly rated beer that is regularly cited as a premier example of its style. Most breweries on the West Coast would have killed to be able to brew a DIPA as crisp, flavorful and well-balanced as Double Jack, and if they could magically swoop in and take the recipe now that it’s retired, they would. That beer was better than the vast majority of DIPAs on the shelf. Hell, the last time Paste blind tasted DIPAs in 2015, it finished at #5 out of 115 beers. And yet, a brewery can’t afford to ever rest on its laurels. We are entering a challenging period for the craft beer industry, where many larger, regional breweries are posting actual losses/shrinking sales for the first time in a decade. As the flow of brand new drinkers entering craft beer has slowed, and the number of small, local breweries has surged, it would seem the presence of your corner brewery with its 10 barrel brewhouse has finally cut into the bottom line of national craft beer presences such as New Belgium, Boston Beer Co. and Sierra Nevada. And it’s the older brands that are most at risk. And then of course, there’s the continued evolution of IPA to contend with. Only two or three years ago, we were talking about IPAs with tropical fruit-forward hop varietals such as Citra and Mosaic as novelties, and possibly an emerging new substyle. No one was using the term “NE-IPA” yet in reference to the turbid, ridiculously juicy beers emerging out of Vermont and Massachusetts. But how quickly things change, right? Only a few more years back, and breweries were actively chasing and courting bitterness in their DIPAs. Now, they’re more likely to be trying to avoid substantial bitterness at all costs, while producing IPAs and DIPAs that are gentler, sweeter, juicier and far more fruit driven. Breweries like Sierra Nevada are producing beers such as “Tropical Torpedo,” taking a venerable older brand and attempting to use it to chase the tropical dragon. Everyone needs a piece of this latest pie. Stone was apparently in the same boat when they chose to redesign Ruination into Ruination 2.0. Firestone no doubt had the same option—redesign, or start fresh. They chose the bolder of the two routes. So perhaps it was with that in mind that Firestone Walker discontinued Double Jack. Yes, it was great, but perhaps it was a great example of a style that was simply on the decline. DIPA must still be among the bigger American craft beer styles, but in that California market, it also must be among the most saturated. Perhaps Firestone simply wants to forge into other styles and create beers that stand a better chance of growing explosively, rather than contracting. There’s a lot of interesting stuff in there. Both wheat and oats have become popular in IPA brewing for the creamy mouthfeel and soft texture that they help deliver, which mixes well with an IPA with correspondingly lower bitterness and a greater emphasis on aromatics. A lot of the great IPAs we’ve praised in the last two years from the likes of Maine Beer Co. or Grimm Artisanal Ales have been made with oats. As for the hops, it may sound weird to you to see some German hop varietals involved in a West Coast DIPA, but the newest generation of “noble hops” have come a long way and become an entirely different sort of beast. Look no further than Firestone Walker’s own Easy Jack, which makes heavy use of German Mandarina Bavaria to achieve it’s pleasantly orange-citrus aroma. Judging from the nose on Fortem, I wouldn’t be surprised if there’s plenty of Mandarina Bavaria in here as well. EDIT: The hop varietals weren’t specifically named via the press releases, but they are indeed available on the beer’s official page on the Firestone website. It’s a big blend of old and new school: Cascade, Citra, Simcoe, Mosaic, Blanc (which I assume means Hallertau Blanc) and yes, Mandarina Bavaria as I suspected. The nose is a perfumed blast of hops I can smell from a foot or two away when I crack the can and start pouring—always a good sign. It’s big on citrus, with lots of lemon, grapefruit and orange, but also strongly floral impressions as well, like orange blossoms. Going back to it, I get an array of fruit, but little in the way of pine or resin. Instead, I get hints of pineapple and passion fruit; it’s both citrus and tropical in inspiration. The aroma suggests sweetness and juiciness, but with a bit of the older-school pith/zest character as well. It’s a lovely, very expressive nose. On the palate, Fortem isn’t quite as juicy and sweet as the aroma might suggest, which I was actually a bit thankful for. Surprisingly, my first impression and note are about the malt profile instead of hops: It has a really nice bready, grainy baseline that contributes much more character than the essentially invisible malt profiles you’re seeing in most noveau IPAs. The presence of the wheat is presumably shining through here. In terms of hops, it’s citrus forward, with moderately strong, juicy flavors of orange, grapefruit, melon and more exotic tropical fruit, and the mild, approachable level of bitterness you would expect from an IPA trying to stay on-trend in 2017. I definitely think there’s some Mandarina in here, as the overall profile reminds me more of an upscaled version of Easy Jack than it does Union Jack or the departed Double Jack—although the differences aren’t that vast in scope. Yes, it’s “sweeter” than Double Jack would have been perceived, but that doesn’t mean it has a “sweet” profile overall. Compared to say, the ultra-juicy and sweet NE-IPAs out of a brewery like Tree House, we’re still talking about a beer that favors balance. Another thing that stands out is pure drinkability. This stuff is much more quaffable than the more bracing, substantial profile of Double Jack, due both to the lower ABV and the lower perceived bitterness. Fortem is dangerously easy drinking. Quaffing it reminded me of the earlier days of the craft beer movement, when you could expect to be served shaker pint glasses of IPA at almost any bar because “proper glassware” had yet to become standardized. No, it’s not what a cicerone would recommend, but there’s something about this beer that begs for that 16 oz serving, 8.2% ABV or not. It just feels right. Call it a “beach party DIPA,” as absurd as that sounds. There’s no surprise this is being packaged exclusively in 16 oz cans. All in all, I think Firestone Walker has done an admirable job here of creating a new beer that channels some of Double Jack’s characteristics while tailoring it more closely to what the market is currently dictating. It’s odd to me that the beer was designed from the start as being available for only a single quarter of the year, but you have to assume that this is a bit of a trial run for it. If their customers go crazy for Fortem, they’ll surely find a way to make it more often than 25% of the year. There are plenty of beer geeks, myself included, who will miss Double Jack. But Fortem is at least proof that Firestone Walker will continue making great IPAs in any style where they choose to focus their efforts. I’ve consumed enough of their beers to give them the benefit of the doubt. Jim Vorel is Paste’s resident beer guru. You can follow him on Twitter for more absurdly long-winded reviews.